AZUSA >> A four-hour SWAT stand-off at an Azusa condominium came to an end Sunday after authorities found the suspect dead. 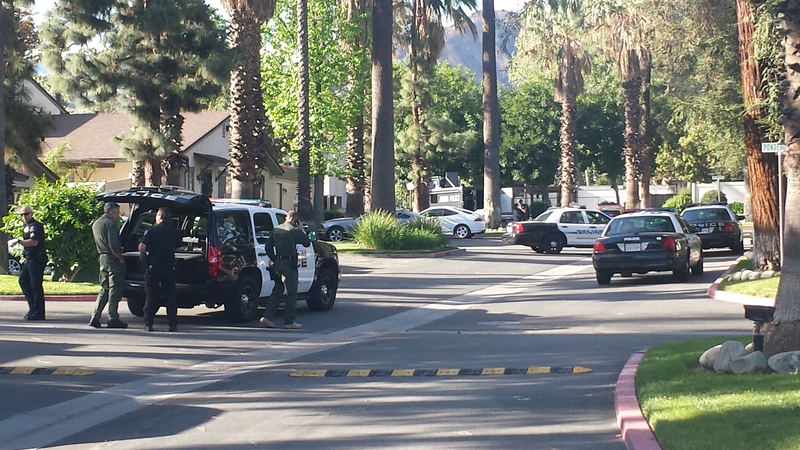 Few details were initially available regarding the stand-off, which began shortly after 3 p.m. in the 800 block of Pepper Tree Drive, just east of Azusa Pacific University. Initial reports and police radio traffic indicated a suspect had fled from police before breaking into a nearby home. Police then received information that there may be a shotgun stored inside the home where the suspect was believed to be holed-up. Officials evacuated surrounding homes, including those along the south side of Silver Maple Drive, and took tactical positions. Via Twitter, police asked people to refrain from posting photos of officers moving into position. Police and news helicopters circled overhead as officials made continuous loudspeaker announcements into the home. The suspect had reportedly suffered a cut to his arm while fleeing police, and was spotted unresponsive inside the condo. Paramedics pronounced the suspect dead about 7:15 p.m., Los Angeles County Fire Department Dispatch Supervisor Michael Pittman said. No description of the dead man was available, and no further details were released. Up to an inch of rain, wind and perhaps snow above 5,000 feet is being forecast for Southern California on Monday and Tuesday, the National Weather Service said Sunday. Officials in Glendora wasted no time in reacting as it raised the city’s alert level to yellow and enacted parking restrictions in case of mud or debris flows from the bare hillsides of the recent Colby Fire burn area, officials said. “Yellow alert asks residents in the Impact Area to be alert and mindful that there is a storm forecasted and conditions could change and be more intense than currently forecasted,” according to the city statement. The alert involves no evacuations or restricted , however residents in the Colby Fire area are advised to not park vehicles along the street, as well as remove trash bins or other obstructions from roadways. Vehicles and objects left in the street may be towed or removed. “It looks like we’re going to get probably a quarter-inch to three-quarters of an inch (Monday) night into Tuesday, Metrologist Curt Caplan of the National Weather Service’s Oxnard office said. The snow level was expected to drop to between 5,000 and 5,500 feet. “We’ll get a few hours of steady rain with this first front that’s going to move through,” Caplan said. “We’ll probably have some scattered showers Tuesday into Tuesday evening. Rain amounts could be higher if thunderstorms accompany the rainfall, however that was next expected to be the case, Caplan said. Any thunderstorms associated with the incoming weather system were expected to dissipate well before reaching Los Angeles County. Light showers may continue into Wednesday in Los Angeles County, officials said, and they were likely in the Inland Empire, according to the NWS. Partly cloudy conditions and high temperatures in the mid-70s are predicted by Saturday in the San Gabriel and San Fernando Valleys, as well as the Inland Empire. And by Sunday, clear skies and high temperatures near 80 degrees are expected throughout the region. LA MIRADA — A big rig that crashed and erupted into flames forced the closure of all but one lane of the northbound 5 Freeway in La Mirada early Sunday, officials said. The driver escaped unharmed following the 2 a.m. crash on the freeway near Valley View Avenue, California Highway Patrol Officer Tony Polizzi said. But the crash created a fiery wreck that snarled traffic for more than nine hours, officials said. The big rig, which was believed to be the only vehicle involved in the crash, struck and damaged a 100-foot length of guardrail before catching fire, Polizzi said. Officials reported diesel fuel leaking into the roadway as well. After firefighters initially extinguished the flames, the scorched truck rekindled shortly after 4:30 a.m., according to CHP logs. All but the fast lane of the northbound 5 Freeway was shut down at Valley View Avenue as officials cleared the wreckage and made repairs to the damaged guardrail, Polizzi said. The No. 2 lane was reopened just before 11 a.m.
No estimate of when the two right lanes of the freeway would reopen was available. Whittier Police arrested a teenager who shot at a police officer trying to stop him late Friday, officials said. INDUSTRY >> Authorities have released the identity of a 20-year-old Los Angeles man who was thrown from his motorcycle and run over by a big rig in a crash on the 605 Freeway late Friday. Manuel Paleo died following the 7:30 p.m. collision on the southbound 605 Freeway near Peck Road, Sgt. S. Coleman of the California Highway Patrol’s Santa Fe Springs office said. He was riding a 2002 Honda motorcycle when he rode onto the shoulder to try to pass a big rig that was traveling ahead of him in the right-hand lane, the sergeant said. Los Angeles County Fire Department Paramedics pronounced Paleo dead at the scene, Coleman said. Any witnesses were encouraged to contact the Santa Fe Springs office of the CHP at 562-868-0503. The magnitude-5.1 earthquake centered just east of La Habra on Friday night was felt throughout the region, however the damage it caused was primarily isolated to a pocket of northern Orange County, where 26 homes were red-tagged, officials said. Dozens of aftershocks continued to rumble through the night, including one measured at magnitude 3.6 at 9:30 p.m. Friday, and another measured at magnitude 3.4 at 9:02 a.m. Saturday, according to the U.S. Geological Survey. And more were expected, USGS Geophysicist Doug Given said. “We anticipate there will be a few more,” he said. The quake rattled windows and nerves throughout Orange and Los Angeles Counties, but Fullerton was hardest hit by the quake. As officials made damage assessments overnight and into Saturday, 20 apartment units and six houses in Fullerton were deemed uninhabitable and red-tagged, Fullerton police Sgt. Mike Chlebowski said. Residents would not be allowed to reoccupy the homes until they were checked out by an inspector, he said. And work on a ruptured water main at Rosecrans Avenue and Gilbert Road Street continued to force a road closure Saturday morning, Chlebowski said. But no earthquake-related injuries had been reported Saturday, in Fullerton or elsewhere. No buildings had been red-tagged, though a couple dozen La Habra residents had evacuated their homes voluntarily due to safety concerns, Davis said. Authorities had initially feared possible structural damage at three apartment buildings that were especially rocked by the quake in the 2500 block West Whittier Boulevard, the 400 block of North Idaho Street and the 700 block of West First Avenue, Davis said. Considering how close La Habra lies to the earthquake’s epicenter, “We fared pretty well,” he said. “The La Habra Police Department has received multiple reports of broken windows throughout the community, with some areas reporting natural gas smells,” La Habra city officials said in a written statement. “Gas was shut off in the 1200 block of (South) Beach (Boulevard), as a precautionary measure. LA Fitness, which is located in one of the shopping complexes near the intersection of Imperial (Highway) and Beach (Boulevard), had water running off the roof. At Beach (Boulevard) and Lambert (Road), the traffic signal was hanging precariously, but it has since been removed. Reports of natural gas leaks were also widespread in Rowland Height, Los Angeles County Fire Department officials said. A ruptured pipe caused water to flow from the ceiling of a Rite Aid Pharmacy along Colima Road, but the issue was handled within about 20 minutes, Los Angeles County Fire Department Dispatch Supervisor Cheryl Sims said. Officials had previously reported the incident as occurring at a pharmacy along Nogales Street. 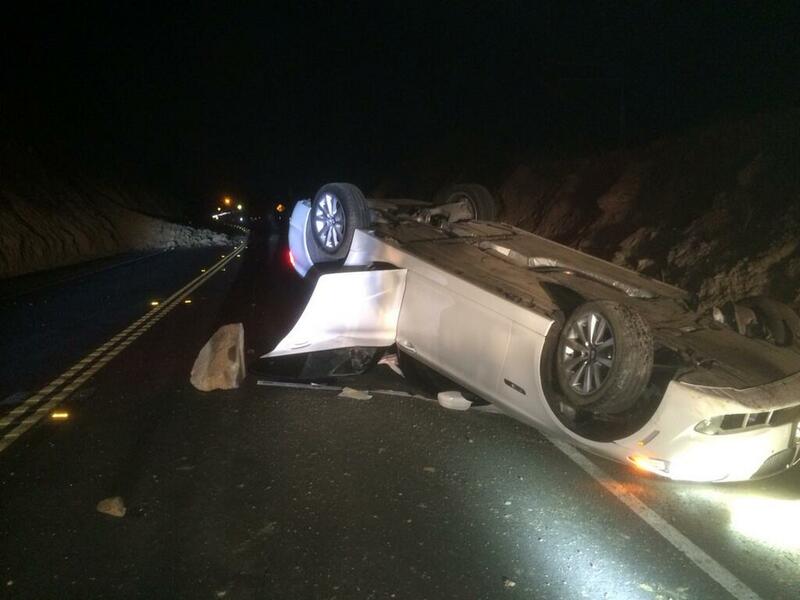 Near Brea, a rockslide along Carbon Canyon Road was blamed for causing a car to overturn, Brea police said. The crash resulted in only minor injuries, however the roadway near the county line remained closed Saturday. The Red Cross set up an evacuation shelter at the La Habra Community Center, 101 W. La Habra Boulevard, where 38 people spent the night, Red Cross spokeswoman Meredith Mills said. It remained open through Saturday morning. “We’re definitely here to help people if they need it,” Mills said. A preliminary survey found “no significant reports of damage” in Los Angeles County, according to a statement issued by the Los Angeles County Office of Emergency Management. Los Angeles County’s bridges and other infrastructure were also free from reported damage Saturday, Los Angeles County Department of Public Works officials said. Friday’s earthquake was believed to be associated with the far east end of the Puente Hills Thrust fault system, Given said. “This is the fault system that, on its northern edge, was responsible for the Whittier Narrows Earthquake in 1987,” Given said. Prior to the Whittier Narrows earthquake, the fault system had been unknown. Scientists in Pasadena had a four second warning before the shaking reached them from the La Habra area thanks to an experimental early warning system that’s been in operation for two years, Givens said. Givens said he hoped increased funding on the federal and national levels would soon help bring the technology to the mainstram, as has been done in Japan and Mexico City. About 200 Southern California Gas Company customers remained without service Saturday morning as crews rushed to fix leaks and restore service to customers whose gas was shut off my earthquake valves, according to the utility. Those who suspect a natural has leak were advised to leave the area immediately and report the leak by calling 800-427-2200. Preliminary data suggest Friday night’s 5.1 magnitude earthquake occurred near the Puente Hills thrust fault, which stretches from the San Gabriel Valley to downtown Los Angeles and caused the 1987 Whittier Narrows earthquake, USGS seismologist Lucy Jones said. Hall of Fame announcer Vin Scully was on the air calling the Angels-Dodgers exhibition game in the sixth inning at Dodger Stadium when Friday’s quake occurred. Friday’s quake hit a week after a pre-dawn magnitude-4.4 quake centered in the San Fernando Valley rattled a swath of Southern California. That jolt shook buildings and rattled nerves, but did not cause significant damage. Givens said that quake was not associated with the same fault system believed responsible for Friday’s earthquake near La Habra. Officials throughout the region said the earthquake was a stark reminder for California residents to be prepared for earthquakes with supplies and plans. INDUSTRY >> A motorcyclist died late Friday in a crash on the Peck Road onramp to the southbound 605 Freeway, authorities said. The crash was first reported just after 7:30 p.m., according to California Highway Patrol logs. The rider was pronounced dead at the scene. The collision was believed to have involved the motorcycle and at least one additional vehicle, however further details were not immediately available, CHP Officer Peter Bishop said. Officials shut down the right-hand lane of the southbound 605 Freeway as they investigated the scene. WHITTIER >> A SWAT team raided the Whittier home of an ex-convict early Friday, recovering guns and drugs, as well as machinery and information related to a massive identity theft scheme, police said. Ulices Roman Soto, 32, was booked on suspicion of weapon-, drug- and identity-theft related crimes following the raid, Whittier police Officer Bradley White said. SWAT officers used flash-bang grenades to rouse Soto during the operation, which unfolded about 4 a.m. at the mobile home in which Soto was living to the rear of a home in the 8300 block of College Avenue, White said. 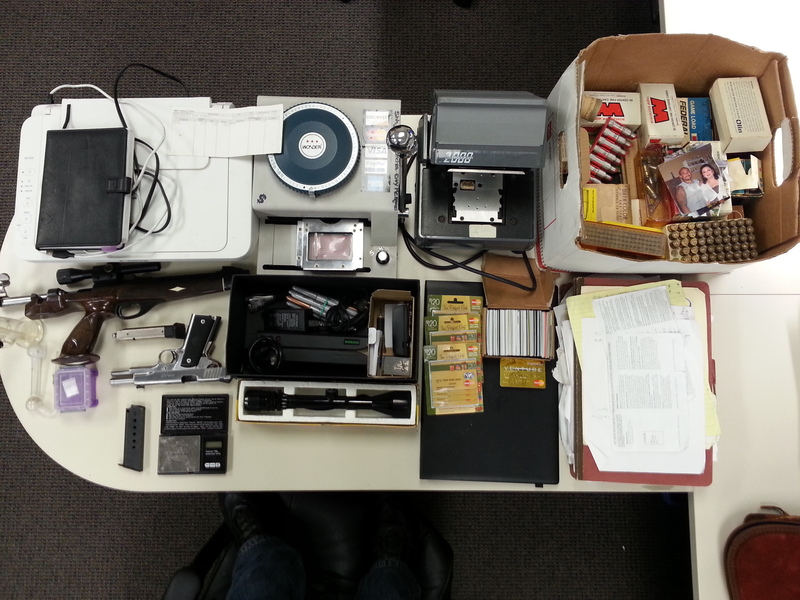 Soto was taken into custody without a struggle, he said, and detectives recovered a treasure trove of evidence from the mobile home. “During the officers’ search, they discovered two firearms, hundreds of rounds of ammunition, methamphetamine, stolen property, (a) credit card embosser, a skimmer, a read/writer device and hundreds of profiles used by criminals to commit fraud,” according tot he police statement. Soto’s equipment was allegedly being used to create fraudulent credit cards using information stolen from unsuspecting victims, White said. Police continued working to identify the hundreds of potential identity theft victims, White added. Investigators suspected the information was stolen primarily via car break-ins. The guns seized from Soto’s home included a .45-caliber pistol and a handgun designed to shoot more-powerful rifle ammunition, White said. A small plastic baggie of methamphetamine was recovered from Soto’s mobile home, along with a scale, officials said. White declined to discuss the investigation that led to Soto’s arrest. He was free on bond from a previous arrest when jailed Friday, according to county booking records. Deputies assigned to the Los Angeles County sheriff’s Norwalk Station arrested Soto March 10, according to county booking records. Further details of the arrest were not available Friday. Prosecutors charged him with forgery and receiving stolen property March 12, the same day he was released from custody on bond, county records show. Los Angeles Superior Court records indicate Soto has a criminal record dating back 13 years. He was convicted in of possession of drugs for sales and transporting drugs in 2009. Soto was convicted twice of drug possession, as well as of being a convicted felon in possession of a gun in 2006. Soto was convicted of carrying a loaded firearm, as well as driving on a suspended or revoked license in 2005. In 2003, he was convicted of driving without a license, according to court records. He was convicted in 2001 of being under the influence of drugs, fighting in public, resisting or obstructing police and a traffic violation. Soto was being held in lieu of $35,000 bail, according to county booking records.